She's very professional and extremely nice. She explained everything in an easily understandable way. I recommed Dr Kim-Jamesto anyone looking for a dermatologist. She's very professional and extremely nice. She explained everything in an easily understandable way. I recommed Dr Kim-James to anyone looking for a dermatologist. Dr. Kim-Jones made me feel as if I was in in very capable hands. She informed me every step of theway about my procedure, stopping several times to make sure I was clear on what she understood to be my preference. She is efficient without being abrupt. Highly recommend her. Dr. Kim-Jones made me feel as if I was in in very capable hands. She informed me every step of the way about my procedure, stopping several times to make sureI was clear on what she understood to be my preference. She is efficient without being abrupt. Highly recommend her. *** Please be a specific as possible when booking your appointment we require a detailed reason for your visit to accommodate your appointment correctly - thank you in advance *** Dr. Helen Kim-James is certified by the American Board of Dermatology. She was born and raised in Dallas. A graduate of Southern Methodist University, she also studied at Oxford University and performed research at Seoul National University under a grant from the National Science Foundation. Dr. Kim-James earned her M.D. from Washington University School of Medicine. She completed her internship and dermatology residency at Barnes-Jewish Hospital affiliated with Washington University. Dr. Kim-James has served as a Clinical Instructor in dermatology at Washington University. 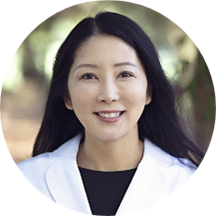 Dr. Kim-James is a member of the American Academy of Dermatology, American Society for Dermatologic Surgery, and American Society for Cosmetic Dermatology and Aesthetic Surgery. Very professional, courteous and friendly. She spent plenty of time clearly explaining everything and ensuring I understood all of the details. She was quick, thorough, clear but didn't seem in a rush to leave. I had a great experience. Got me in quickly, she is knowledgeable and didn’t push for me to get Botox or other items when I was there for my annual check up. Clean and updated office. Nice area! Very professional and she provided multiple options. I had an early appointment and there was no wait time after turning in my forms. Doctor was thorough in her explanations of diagnosis, immediate treatment options as well as longer term options if we have to get to that point. Very Personable, great bedside manner and explains things in understandable terms. Will refer family and friends to this practice. Dr Kim-James was very professional and knowledgeable. I was very pleased with my appointment. I would highly recommend Dr. Kim-James. Almost no wait time. She was very professional and explained things very well. What an amazing visit. Dr. Kim-James was super thorough, explained everything. Her staff was great as well. So happy to have her in Fairview. She is very thorough explained detail from start to finish! Glad I found her!!!! She was very thorough with my exam. Explained everything. Wonderful appointment. She took the time to really talk to me and explain things and never rushed the appt. Knowledgeable and professional doctor. Friendly and efficient staff. Nice, clean, organized office. We highly recommend this clinic! Dr. James was very professional and thorough in her examination. She was easy to talk to and answered all my questions. What I really liked was that I left her office with a print out of her comments and suggestions formy health care----no trying to remember what she said. Her assistant was also very helpful. I was very impressed with Dr. James and the way her office was organized and friendly. I highly recommend Fairview Dermatology. Highly recommend Dr. Kim-James. Professional with excellent communication skills.